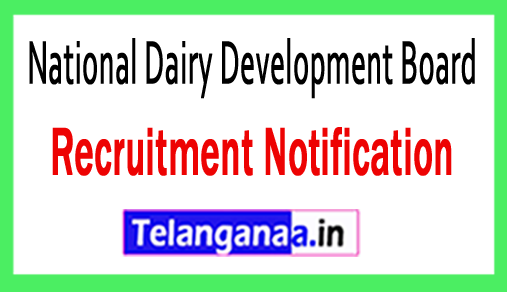 In the form of NDDB recruitment, an advertisement related to a recent career has recently been advertised by the National Dairy Development Board. Efficient and well-qualified competitors can apply by submitting applications for various inadequate posts of Deputy Managers before the deadline of September 21, 2018. Applicants who consider themselves eligible for positions can apply for NDDB jobs and through this page, the remaining information about NDB recruitment 2018 can be collected, written by the team of www.telanganaa.in . Eligibility Criteria: Job seekers should have passed BE / B.Tech. (Civil Engineering) with a good academic record from a well recognized institution. Candidates applying for the above vacancy should be more than 25 years from 01-10-2018. The participation of candidates will be based on their performance in the test / interview, which will be run by the recruitment committee of National Dairy Development Board. The first and essential step of the participants is to go to the official site of the organization, which is http://www.nddb.coop. The expiry date of the online submissions of the application is: 21-09-2018. Click NDB Recruitment Notification here.